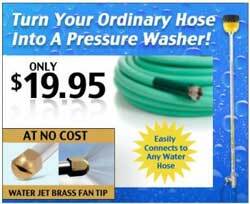 Water Jet Cleaning Solution turns your ordinary hose into a pressure washer. Remove build-up dirt and mold on wood or aluminium siding and concrete foundations. The water jet is great for washing cars, boats and those hard to reach windows. Water Jet uses no gas or electricity - simply attach it your garden hose and the power is there. Get the water jet and receive a bonus gift. The water jet host attachment by its design increases the pressure of your water hose which allows you to reach places not attainable with just the hose. Also the increased pressure allows cleaning more things such as mud and dirt off cars and decks. For the money, product delivers much more than promised! If you want a power jet cleaner that does everything you could wish for, put your money on the table and pay $300+ to get 100%satisfaction. It is a excellent product. I think it would also make an excellent present for anyone that doesn't have a power washer. Truly happy I bought it.